THE BEST TAILGATE ON CAMPUS! Party on the Plaza is the official University of Houston Alumni Association tailgate party held four hours before every UH home football game. The UHAA tailgates are free to all alumni and their guests. Donations are accepted. Bring your alumni card to enter!. WHAT HAPPENS AT OUR TAILGATE? Each home game our alumni team transforms Legend Plaza in front of TDECU stadium into a tailgate plaza. Over 10 different constituent alumni organizations set-up their tailgates within our tent, so that you can enjoy food, fun and football comradery! Typically, POTP starts 4 hours before the game and ends 45 minutes before kick-off. Don’t forget your alumni card! Please have your alumni card to gain entry to Party on the Plaza! If you don’t have your card, you can find it in the Houston Alumni mobile app, available in the App Store and Google Play, or you can find it HERE. To purchase game tickets, please contact the UH Ticket Office at 713.GO.COOGS. 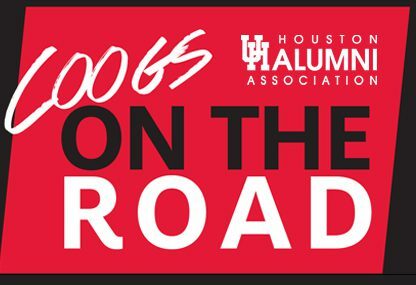 The University of Houston Alumni Association hits the road for away football games. Check back as we get closer to the 2019 football season for more information. For all UHAAF Life Members, the UHAA tailgate tent is exclusively open to you and your guests! So be sure to bring your Life Member card for entry to our tent. If you have questions regarding Party on the Plaza, please contact Joe Rera at jfrera@uh.edu. Our tailgate is open to all alumni, and their guests. The UHAA alumni tent is exclusive to UHAAF Life Members. Life members are asked to bring your Life Member ID for entry. Most of our constituent alumni tents are open to all alumni. How do I purchase my game ticket? To purchase your game tickets to sit in the UH section, please contact the UH Ticket Office at 713.GO.COOGS. How can I become an official volunteer ? We’d love to have you volunteer! Please send us an email to alumni@uh.edu with your contact information. Do I have to be an alumnus to attend? And is there an age restriction? Tailgates are open to all alumni, fans, supporters of UH and their guests. Unless otherwise noted on the page for that particular event, there is not an age restriction.